Protecting and empowering our valued customers is always a top priority at ThreatSTOP. Today, we're taking additional action to deliver better protection and greater visibility related to the WannaCry ransomware attack. On May 12th, an outburst of a new Ransomware named WannaCry (aka WannaCrypt, WCry) took place. 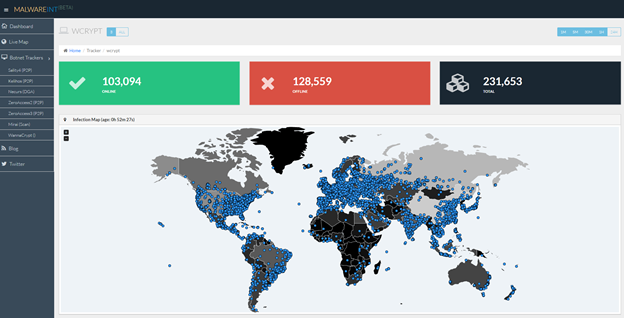 This ransomware, spread wildly in a short amount of time, infected over 100K victims in over 99 countries utilizing the MS17-010 Vulnerability. The following image from the live infection map, demonstrating how big the impact of this campaign had been over the past 24 hours.